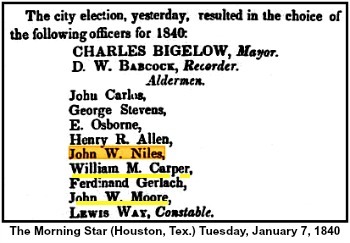 John Warner Niles who was born in Maryland in 1804 to Hezekiah Niles and Ann Ogden. 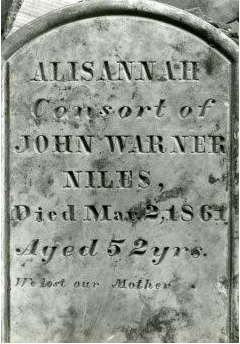 John Warner married Alisannah Wilson in 1833 and they had 3 children. He passed away on Nov. 26, 1845 in Houston, Texas at age 41. The following information is form Sandra Ellington-Freeman, a descendant of J.W. Niles. I do not have a portrait/etching of J. W. Niles. With my genealogy searches, I have gathered a considerable amount of information about him, and his family. (This family was on my Mother's Massie line...) He was a son of ﻿Hezekiah Niles﻿, of Baltimore, who was the founder/editor of the Niles Weekly Register paper there. Hezekiah's close friend was named Warner, whom John was named after, and whose daughter Hezekiah married. 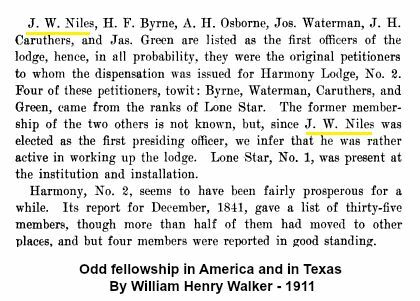 Apparently John Warner Niles went west to Texas. He owned 1280 acres in Montgomery County, TX. according to microfilm records found online. J.W. Niles married my GGGGrandmother, Alisannah Wilson in Baltimore. A few years ago, her headstone was unearthed at the Masonic Cemetery in Houston... (see picture at left... there was an article about that in the Houston Chronicle). I have been frustrated in finding out about the Masonic-Episcopal Cemetery in Houston and what happened to it, and the graves there. I understand that it is supposedly part of the Sam Houston Park now...and that there were graves discovered (and my GGGGrandmother's headstone, where it went to, I don't know). I am certain that J. W. Niles was also buried there. ​Thanks again for the contact, and I was delighted to find your website!